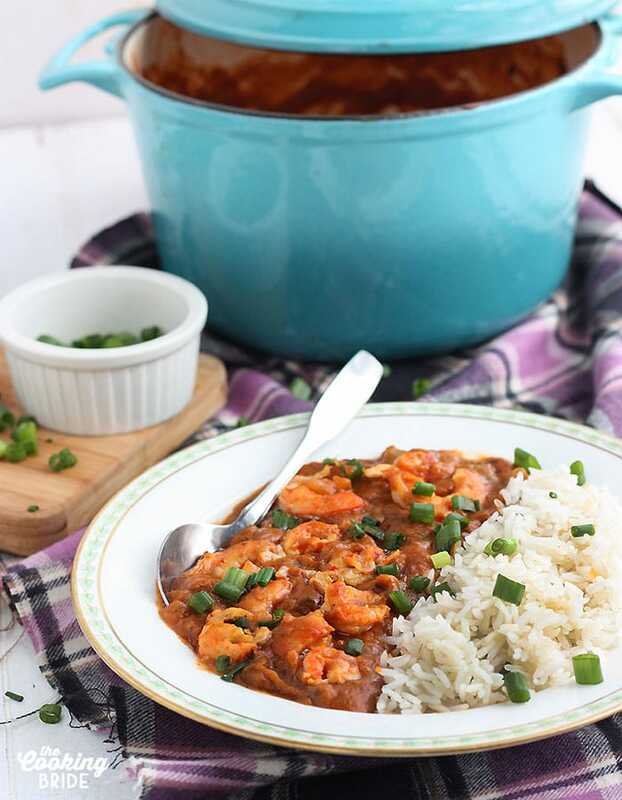 Shrimp and crawfish étouffée is a classic Louisiana dish with lots for flavor. Shrimp and crawfish tails are simmered with vegetables and spices and served over hot cooked white rice. A few months ago, I polled a few friends on my personal Facebook page for feedback on their favorite Southern food recipes. My friend Jermaine, a classmate from high school, piped up that he had a crawfish étouffée recipe he would be willing to share if I was interested. Are you kidding me?!? I told him of course I would be interested. Send that recipe my way! It kind of sounds like something you say when you sneeze, doesn’t it? 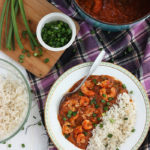 Étouffée, pronounced (eh-too-fay), is a French word that literally translates to “smothered” or “suffocated.” It is a very popular dish Cajun or Creole dish made with crab, shrimp or in this case, crawfish. Étouffée is traditionally served over rice. A lot of Cajun or Creole cuisine starts with a roux. A roux is nothing more than a mixture of fat, such as butter or oil, and flour cooked together. There area few different types of roux, depending on their color. White roux is your basic roux. It’s used to thicken gravy, such as in sawmill gravy. It’s usually only cooked a few minutes to get rid of the raw flour taste. The longer you allow a roux to cook, the less effective it becomes as a thickener, but the flavor becomes more dynamic. Blond roux is cooked until it starts to turn light brown. This is sometimes called peanut butter roux because of the color. Brown, or chocolate, roux is cooked the longest. It’s cooked until, you guessed it, it resembles chocolate sauce. The darker the color of the roux, the richer the flavor. Cajun and Creole cooking are very similar and étouffée is a recipe popular among both cultures. Creole étouffée starts with a blond roux and sometimes contains tomatoes. 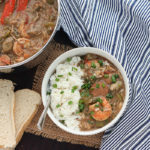 Cajun étouffée starts with a brown roux. I listed out a few tips for making roux in my post for seafood shrimp gumbo. However, I thought it might be a good idea to reiterate those tips here. Always use a heavy bottomed pan. A good stock pot or cast-iron skillet will work. Heat your fat first. Then slowly add the flour. You want to mix in a little at a time instead of all at once to prevent lumps. Cook the roux over medium heat. A good roux takes time. If you try to speed things up by increasing the temperature, you could burn your base. Give it your undivided attention. Some people find making a roux intimidating because it can burn easily. Roux is like a small child. Don’t walk off and leave it unattended. Keep stirring until it reaches your desired color. It should remain smooth. If you notice it separating or it smells funny, you’ve probably burned it. Best thing to do is start over. 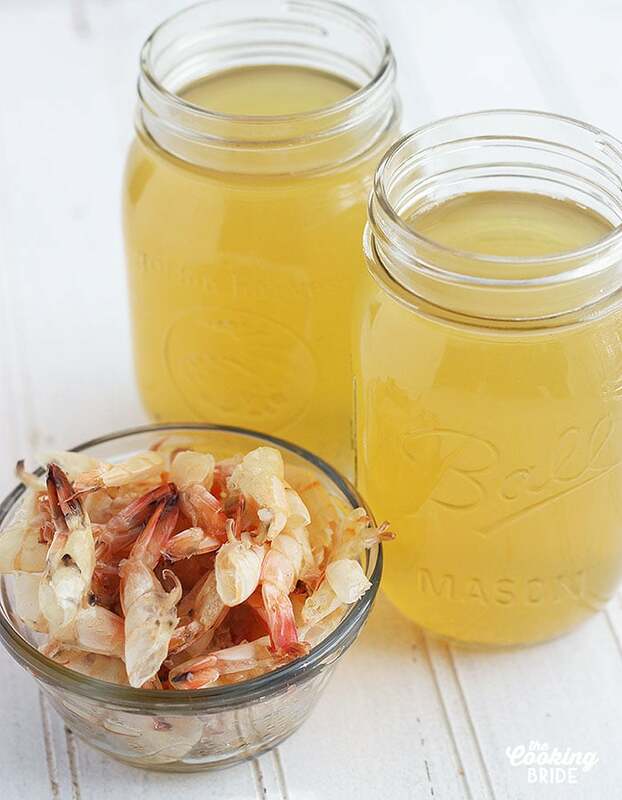 Shrimp Stock: Store Bought or Homemade? It’s no secret that I think buying broth from a store is a waste of money. I have made my own chicken stock for years. However, for a seafood-based dish, like shrimp bisque or crawfish étouffée, I prefer using shrimp stock. I don’t want to dilute that delicious seafood flavor with the taste of chicken. 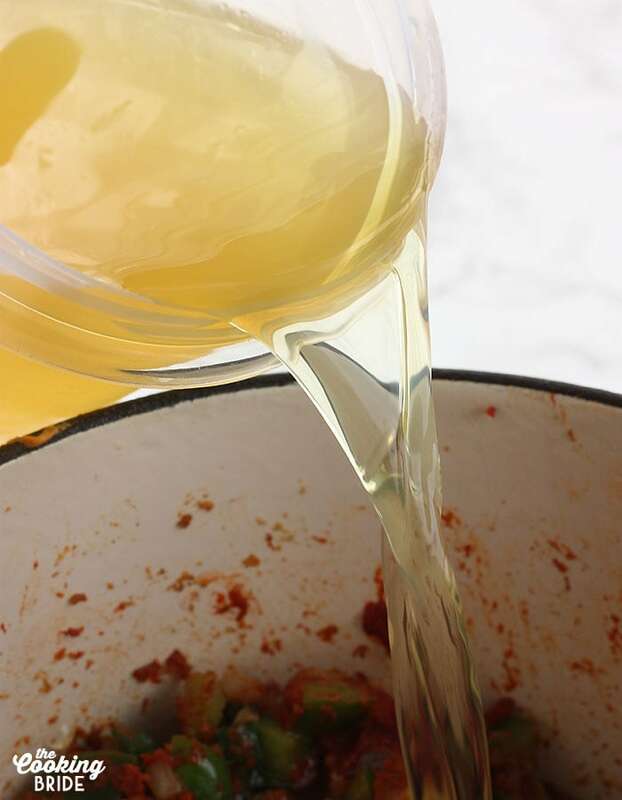 I go into a lot more detail on making your own shrimp stock in this post. Unless you pay extra for shrimp that is already peeled and deveined, you’re going to have a pile of shrimp shells sitting around anyway. Why not use those shells to make your own stock? It only takes 20 extra minutes and it can be made ahead of time. As I mentioned earlier, first we’ve got to make our roux. You can start with either butter or oil as your fat. When I make gumbo, I prefer the flavor of a roux made with butter. But when I add the flour, it tends to form a paste rather than a smooth mixture. So I add a little bit of oil to thin things out. Heat one stick of butter and ¼ cup of oil in a heavy-bottomed pan over medium heat. Once the butter has melted, add ¼ cup of flour. Whisk this until there are no lumps and the roux is smooth. Then repeat with the remaining ¼ cup of flour. Here comes the important part – keep stir, stir, stirring that roux until it turns a light brown, peanut butter color. This could take about 10 -15 minutes, give or take. The important part is don’t let the roux sit on the bottom of the pan for very long. Keep stirring to prevent it from burning. 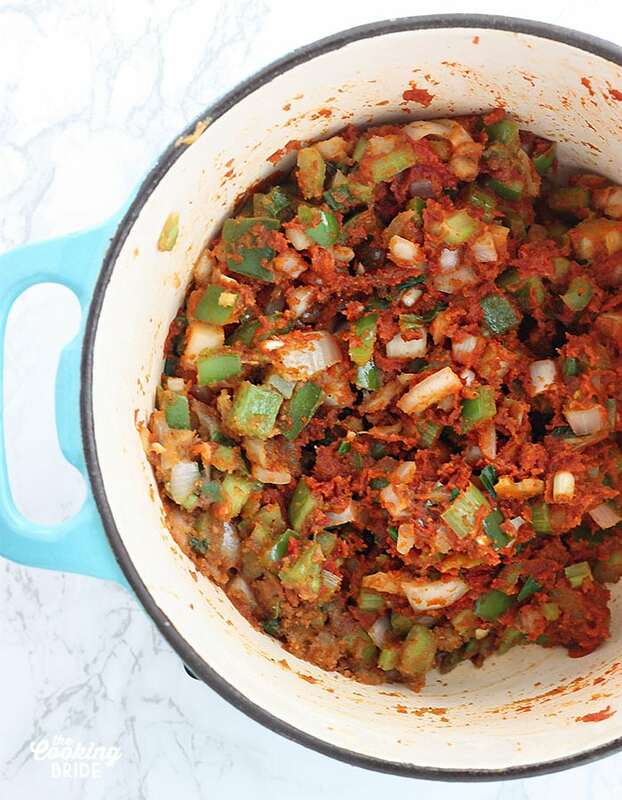 Once the roux has reached the desired color, add ½ cup diced white onion, 1 medium green diced bell pepper, ½ cup diced celery, two cloves of minced garlic and 3-4 green onions, white and green parts diced. Next you are going to add 5 tablespoons of tomato paste and ¼ cup Cajun or Creole seasoning. Jermaine’s recipe recommended Essence of Emeril. I used Tony Chachere’s because that’s what I had on hand. Next add 1 ½ tablespoons cayenne pepper. If you have little ones who are sensitive to spicy food, you might want to leave this out. Add four cups of shrimp or chicken stock. Stir until the roux has melted into the stock. Bring the pot to a boil, then reduce the heat to low, cover the pot and simmer the étouffée for 45 minutes. I would advise to make a point of stirring the pot every 10-15 minutes to prevent the étouffée from sticking to the bottom of the pan. 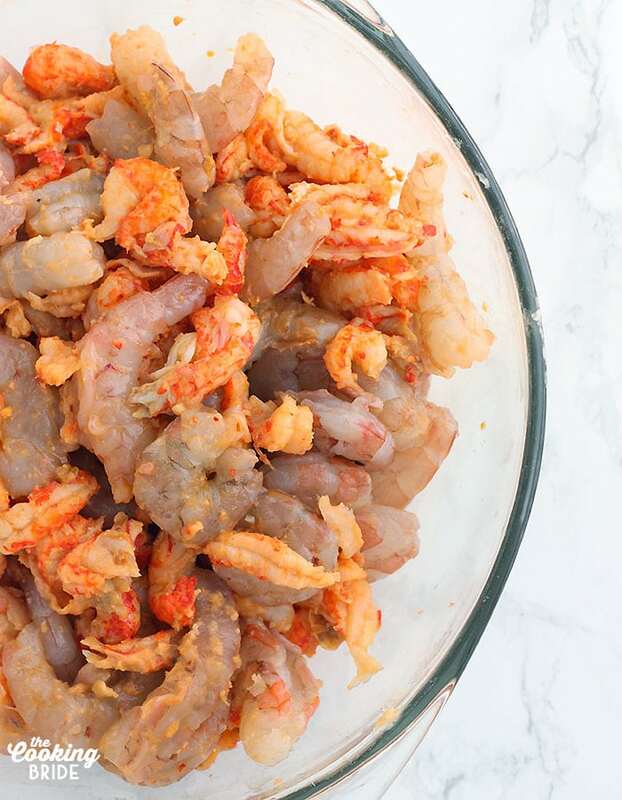 Finally, add one pound of fresh or frozen crawfish tail meat and one pound medium fresh or frozen peeled and deveined shrimp. If using frozen, I recommend letting it thaw first so you don’t have to extend your cooking time. Bring the pot back to a simmer and continue to cook until the crawfish meat is heated through and the shrimp has started to turn pink, about 6-8 minutes. Serve the étouffée over hot cooked white rice and garnish the top with more diced green onions. Jermaine said he was inspired to create this recipe after living in Atlanta for seven years and began to miss the food back home in Mississippi. He started experimenting with different recipes until he created a recipe that was a “great taste of home.” Thanks again for sharing the recipe, Jermaine! 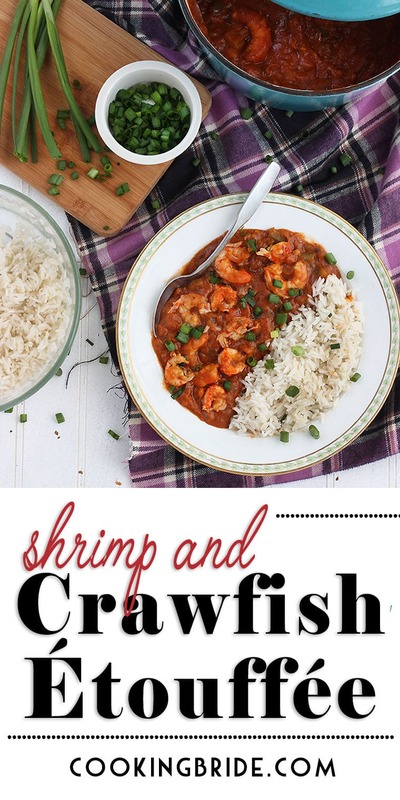 This shrimp and crawfish étouffée recipe has definitely earned a spot in my recipe arsenal. Melt butter and oil in a heavy bottomed pan over medium heat. Once the butter melts, add half the flour and whisk until smooth. Repeat with the remaining flour. 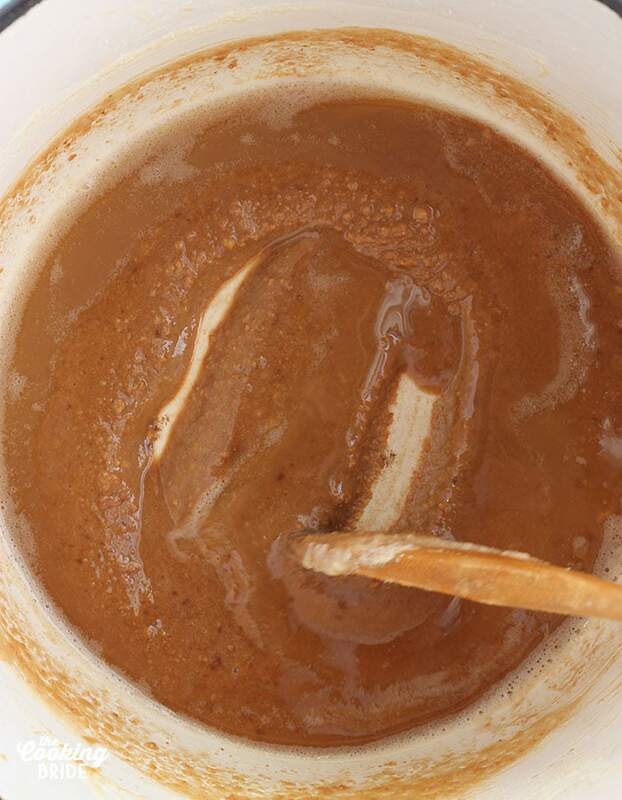 Continue to cook the roux, stirring constantly, until it turned light brown –about the color of peanut butter. Add the diced onion, green bell pepper, celery, garlic, green onions, tomato paste, seasoning and cayenne pepper, if using. Add the shrimp or chicken stock. Keep stirring until the roux is dissolved into the broth. Bring the pot to boil, then reduce the heat to medium low to low. Cover the pot and allow the étouffée to simmer for 45 minutes, stirring every 15 minutes. Add the crawfish tails and shrimp. Simmer until the meat is heated through, about 6-8 minutes. 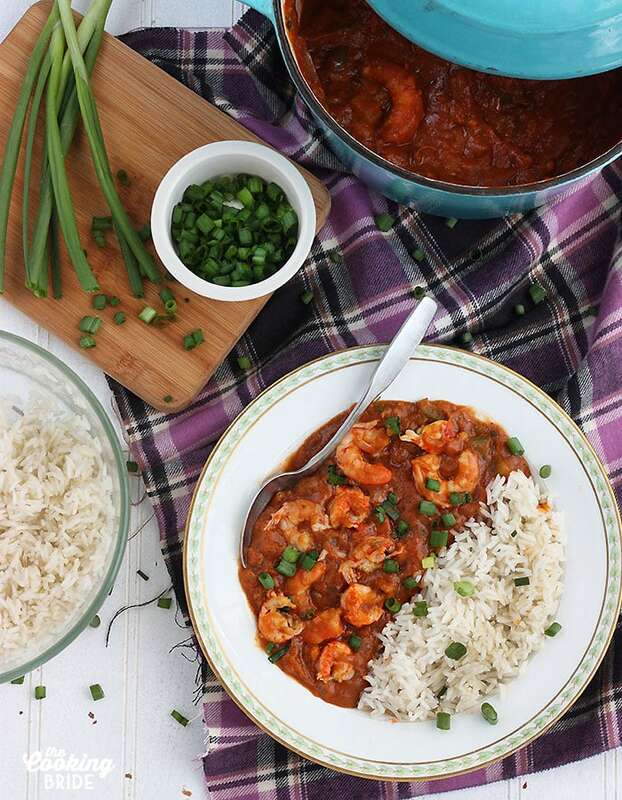 Serve étouffée over white rice and garnish with additional diced green onions. Wow, so many wonderful, super rich and developed flavors in this. The information about the different rouxs is great. I agree, it is all about the roux! What a great friend!! This sounds incredible – I LOVE all of those flavors!!! 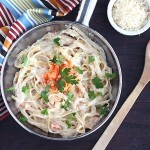 How delicious, this is totally my kind of meal, can’t wait to try your recipe! I have never eaten or made etoufee but it looks and sounds delicious. 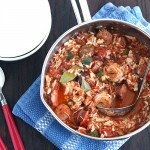 I love spicy seafood dishes with lots of sauce over rice! Going to pin for later!